A funny, enjoyable episode that does a better job of defining the cast than any episode so far this Series. Trying to balance her job as a teacher, her night-work as The Doctor's assistant and her burgeoning romance with fellow teacher Danny Pink is beginning to take its toll on Clara Oswald. She's actually relieved when The Doctor says he'll have to leave her for a few days as he goes on a deep-cover assignment. That relief turns to horror when a staff meeting at work the next day ends with the introduction of Coal Hill School's new caretaker - John Smith. And balancing all the parts of Clara's life becomes very difficult indeed, as The Doctor intrudes on her classes, work gets in the way of her trying to help The Doctor and Danny starts asking too many questions about her relationship with John Smith. * This honestly is one of the funniest episodes of Doctor Who we've had in a while and very little of that humor is based in the RomCom shtick that Steven Moffat usually indulges in when he goes funny. But what else might we expect from Gareth Roberts, who is one of the best New Who writers when it comes to presenting comedy and drama in equal measure with equal skill? * The triangle between The Doctor, Danny and Clara is played off not as a romantic one but more as a disapproving "Space Dad" taking issue with his daughter's new beau. Apart from The Doctor's muttered remark about making the same mistakes again (a reference to the rivalry between himself and Rory Williams and/or Mickey Smith, perhaps?) there is no suggestion of a pseudo-romance between The Doctor and Clara. * Danny Pink continues to impress as a character and good on him for pointing out The Doctor's hypocrisy as well as his aristocratic tendencies. ("I'm a soldier but he's an officer!"). His sarcastic "Sir, Yes Sir!" act was particularly delightful. A lot of play has been made this season of The Doctor's antipathy for soldiers and military thinking which has been somewhat perplexing given The Doctor's history with UNIT and his long-friendships with the career soldiers there (Come to think of it, The Brigadier became a math teacher for a time...) and Pink's assertion here is a brilliant explanation of that contradiction. Like Jon Pertwee's Doctor, Capaldi's Doctor is a patrician who is only anti-authority when he isn't in the role of the authority. * Alternatively, Danny takes Clara to task for her attempts to fragment her life by pointing out that - for whatever reason - she doesn't trust him enough to let him know everything about her. 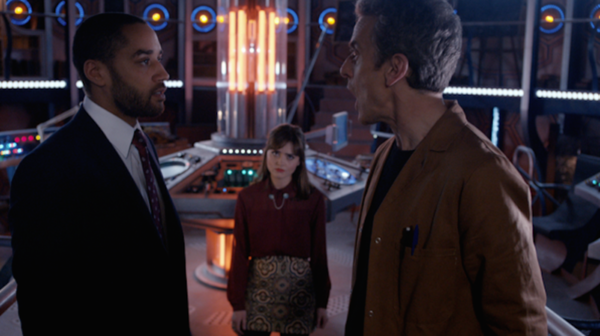 More, this scene offers an analysis of Clara's character that has been sorely lacking until recently. Clara has been unique among companions with a romantic interest in trying to hide that life from her significant other and Danny's demanding an explanation for why she feels the need to keep that secret is not unreasonable. Again, this is played not as a suspicion of her cheating on him romantically but a pain born of the idea that she could/would not be honest with him. * Everything with Courtney Woods aka The Disruptive Influence. Most of what we see of her suggests a potential companion and The Doctor even notes that he may soon have a vacancy. But Roberts wisely takes the time to show why Courtney isn't really companion material at the end as we get a scene that shows that, however prickly he may be at times, Capaldi's Doctor really does have one care to give. * While not quite as bad as some of the Series 8 episodes in regards to feeling repetitive, a lot of the bits with The Doctor failing to fit in as he goes under deep cover do come off as a little too close to similar bits of business from Roberts' previous scripts for The Lodger and Closing Time despite the efforts at disguise this time being underplayed by Capaldi's Doctor. * On that note, some of The Doctor's dialogue does seem to have been written more for Matt Smith's Doctor than Capaladi's, despite the performance. * The Flip. Just... The Flip. This episode provides high-quality character comedy while being a marvelous character study of both The Doctor and Clara, though one wonders how much influence Moffat had on the final product and how much the episode's few flaws might have been born of his hand.